Snap-on is always up to something. The company has been running on-line draws affording customers the opportunity to win an amazing array of items for some time now and are still doing this. Now the company is helping save an endangered animal too, and has been for a number of years. 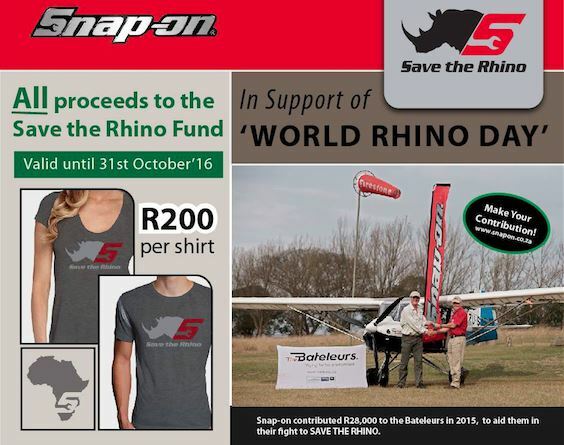 Purchase your stylish SAVE THE RHINO men's or ladies' t-shirt for just R200 a shirt from Snap-on and all funds will be donated to the save The Rhino Fund. Last year the company contributed R28 000 to the Bateleurs www.bateleurs.co.za in their fight to save these precious animals and they hope to surpass this amount in 2016.